RAMPS and Keepers of the Mountains are hosting the 9th annual Mountain Justice Fall Summit on Kayford Mountain, October 24th-26th. Join us for a weekend of workshops, discussions, storytelling and music as we celebrate the changing of the leaves at the beautiful Stanley Heirs Park on the edge of destruction. Register Now! For this year’s fall summit we’re gathering a diverse group of folks, including local community members, Appalachian organizers, and college students, to create an inter-sectional gathering to discuss the many issues affecting our communities more holistically: covering issues including Mountaintop Removal, Fracking, Water, Health, Drug Addiction, Jails and Prisons, Colonization, Local Plants, Military Industrial Complex, Direct Action, Community Organizing, Disaster Response and much more. Register Now! If you are unable to attend, please consider donating to help cover the cost of the event. Can’t wait to see you on Kayford! For more info: check out this page, email [email protected] or call 304-854-2621. For more pictures and or HD quality, see media contacts at the bottom of the article. Friday – All 5 folks have been released from jail on the own personal recognizance. 3:30 PM – The five activists arrested have been set a $1,500 bail each. They are all scheduled for arraignments in the morning, where charges will be made official and bail may be reset. 10:15 AM – Five activists arrested and taken away in association with the banner hang this morning. Waiting to hear their charges. Two fire trucks responded to the scene and have removed the banner. Roanoke, VA – Early this morning members of Mountain Justice, Rising Tide North America and Radical Action for Mountain’s and Peoples’ Survival (RAMPS) hung a banner, suspended between two downtown buildings on Jefferson street in Roanoke. 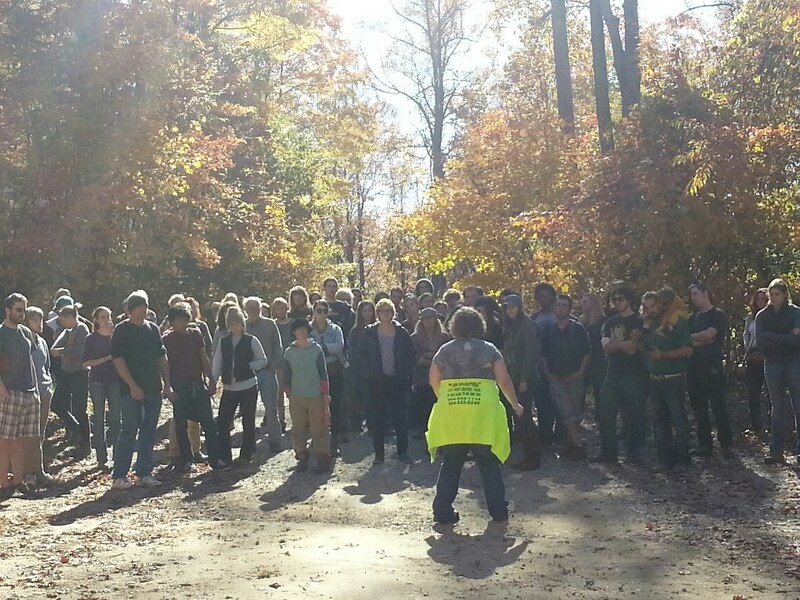 The groups are acting in support of community demands in Virginia, Kentucky, West Virginia and Tennessee that billionaire coal baron Jim Justice stop poisoning water, exposing communities to devastating mountaintop removal coal mining operations and leaving central Appalachia a public health disaster. 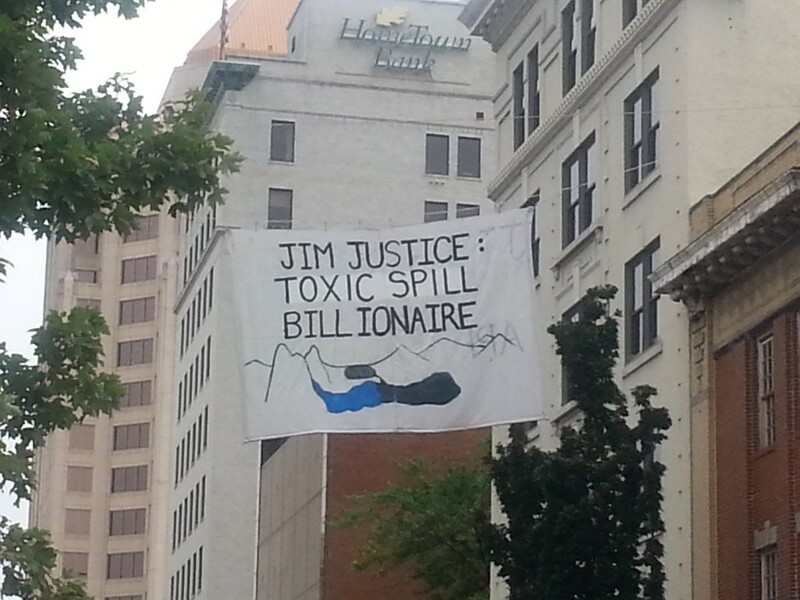 The banner which reads; “Jim Justice Profits, Appalachia Pays. The activists hanging the banner are with Mountain Justice, a regional group committed to an end of Mountaintop Removal and a just economic transition for Appalachia. They are joined by RAMPS, based in West Virginia, and Rising Tide North America, an international network of grassroots groups focused on stopping climate change. And we can’t wait to tell you about it. When we reflect on ourselves as an organization, we realize that RAMPS is very different than it was even 9 months ago. We’re pretty excited about the way that we’ve evolved, so we’re writing to tell you about it in hopes that you’re as excited as we are and ask you to help support this work with a donation. Our campaign here in southern West Virginia was profoundly impacted by the coal-processing chemical spill that poisoned the drinking water of 300,000 people. Our work in the wake of this ongoing water crisis connected us more closely with some of the communities most vulnerable to the abuses of an extractive economy, and our current projects are working to build power in those communities. RAMPS pursues this work through participation in several new local projects, while continuing to work regionally and continentally to connect, build, train, and support the larger “movement”. 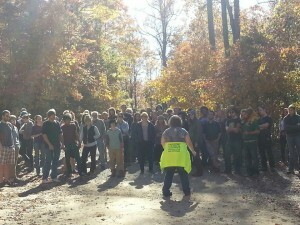 Over the last few months, RAMPS has broadened the scope of our local work and broadened the way we conceive of and employ “direct action.” In addition to confronting the coal industry at the point of extraction, we see direct action also as direct intervention, direct support/service, working to create community based solutions and community organizing and empowerment. All of this is Radical Action for Mountains’ and People’s Survival. We know that the destruction of the land is always dependent on economic and political oppression of those who live on it. More and more RAMPS is seeing our role as working to subvert the power structures that rob Appalachians of their health, clean water, and self-determination while simultaneously providing direct support to those most impacted by these abuses and connecting these local struggles to similar struggles in other communities. Since February, we have created the Stories from South Central project and were an integral part of creating the West Virginia Clean Water Hub and the Kanawha Forest Coalition. Below is some more about each of these new projects. 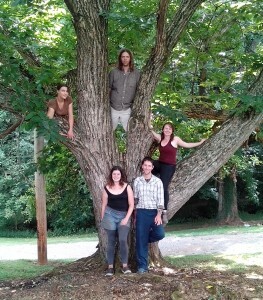 If you want to support these projects and help us shift power in Appalachia, please consider a financial contribution to keep them running.